I've got this on my TBR list too. Nice pick! Wow! Something tells me that this book will be controversial. Fantastic pick! I want to read this one. I've heard so much about this one. I think I need to read gayle Formans other work first though. Thank you for the recommendation, and I hope you love it. Great pick! I still need to read some of Gayle's other books, but this sounds like a good read as well. Thanks for sharing! I'm adding it to my TBR list. I hope you enjoy it! I am a fan of Gayle Forman! Great pick. 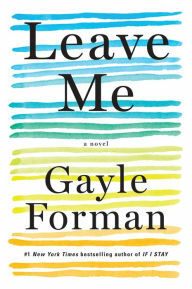 I need to check out some of Gayle Forman's works! I haven't read any of Gayle's 'adult' books. I don't know if this one really interests me, but I hope you enjoy it. Curious to see how this one ends. This one's on my TBR list. Looks good. Happy Reading! That sounds interesting, hope you enjoy!